Now through Sept. 30th get FREE Add-Ons + FREE Shipping with the purchase of a new Mundo Lux, Sweet Curry or Supermarché. That’s a $349 savings to get your wheels rolling before the first bell rings! *Add-Ons can not be swapped out for other Add-Ons, don’t even ask. Looking to retire your minivan, or just replace some of the local car trips with quality family time? Yuba cargo bikes are the perfect urban movers for people, stuff, and even dogs, and turn schlepping chores into everyday adventures. Whether you're delivering your homemade goods to local customers, dropping the kiddos at school, or bringing Fido along on a bike camping trip, Yuba hauling machines will help you deliver your precious cargo with ease and style. Throughout the season, we will endeavor to stock a range of models for test-rides, along with a selection of popular accessories. We can help you figure out the best set-up for your needs, and help you quickly order your desired options. The most affordable cargo bike in its class. Great functionality, minus some bells and whistles. A real workhorse, perfect for around-town delivery, school-mobile, weekly grocery hauling, urban gardeners or dog-owners! 1-3 passengers / 400 lbs payload. 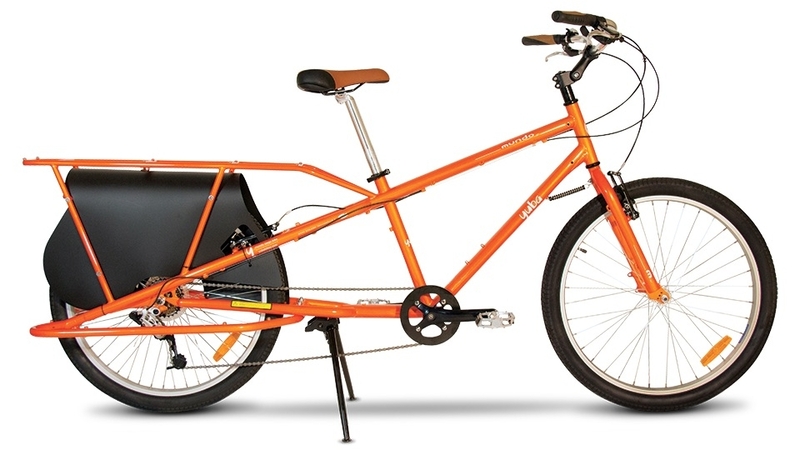 Full-featured cargo bike with a cruiser feel and nimble steering. The small compact frame offers versatility to your daily transportation, easily fitting on bus racks, storage sheds and bike lockers. Weighs just over 40 pounds, but hauls 220 PLUS the rider! 1-2 passengers / 220 lbs payload. A plush ride for the whole family, souped up with a lighter-weight frame, hydraulic disc brakes, Shimano 3x8 shifting, integrated lights and fenders. Playdates? Family outings? Camping trips? Going car-free? YES! Rethink everything. If you've ever wondered how you can get everything done without a car, here's your answer. A video is worth a thousand words, but a test ride is even better. Come on in to try one! 1-3 passengers / 300 lbs payload. Lighter aluminum frame and lower center of gravity make this a great and stable option for smaller riders carrying big loads. Readily accepts Yepp child seats and cargo bags, making this a perfect vehicle for all your errands and outings. Not quite ready for dedicated cargo? An assortment of bike-mounted racks, bags and baskets.